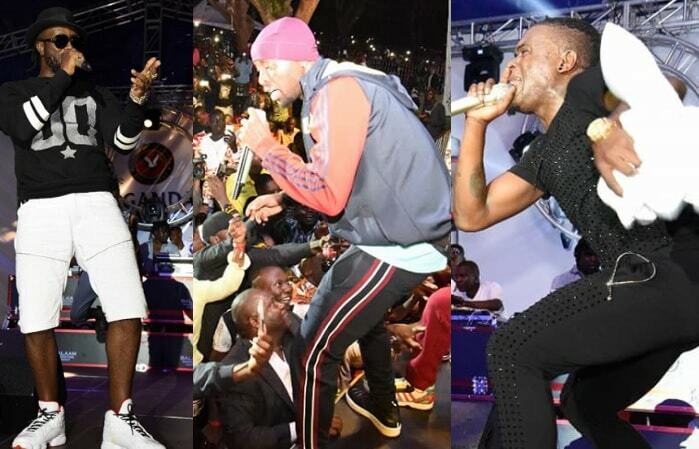 Bebe Cool, Eddy Kenzo and Weasel performing during the End of Year of party. The Bebe Cool list has since become a basis for discussion with more artists reacting to the same, but little did they know, that he was paving way for his latest track, Your Love, that he has done with Honorebel ft Charly black and Pitbull. A Pass - "My brother Bebe Cool I saw your list of artists that did well in 2017, I was chilling at Méstil Hotel & Residences enjoying my evening. But, what do you want from me my friend? That list looks like is composed of weak artists because some of us who can handle you are not listed, but this year, I am going to show you levels that you've never seen before, I'm now going to work hard so I can appear on your list this year. "Thanks to all fans that have not given up on me and have kept supporting me even when Bebe Cool had so many popcorn hits in 2017 and a bunch of his friends on his list. We are going to show them this year 2018." Weasel - "He is already 50 and he keeps on doing songs like Kakanya which he should leave for the likes of Fik Fameica, let him concentrate on the fans in his age group and leave the Fameica fans to be.. In fact, he should also concentrate on making cakes with his wife." Bebe Cool did not spare this one, he responded. "Zuena's wedding cakes cost from 4 million Ugsh ($1200) and above depending on the size, Compare this business to a fading, shabby, malnourished local artist in Uganda whose tag price is 1.5m to 2m per gig." "By the way, when we are talking music, that topic is too complicated for Weasel, " Bebe responded on call while in South Africa. Ziza Bafana - Which list is he making when he can't even write a song?, I write all my songs. Can he even play any musical instrument? We should get serious, people like Diamond Platnumz have not been here for long, but are doing far better than these list makers..Okay if you are specializing in making lists, give us a list of properties owned by the artists.."
He then reached out for an organ and did Bebe Cool's Kamwako song with his real voice, it sounded nice. That is what they call doing a VIP show, has that list maker ever done one other than performing in play fields and bars.